This Asian speciality is basically ravioli or to be historically accurate, the other way around. For pasta came from China. You can make the little circles of ‘pasta’ yourself but if you have access to a Chinese or Japanese shop, it’s so much easier to buy the packets. What is the difference between gyoza and potstickers, perhaps the gyoza is finer and softer in texture. 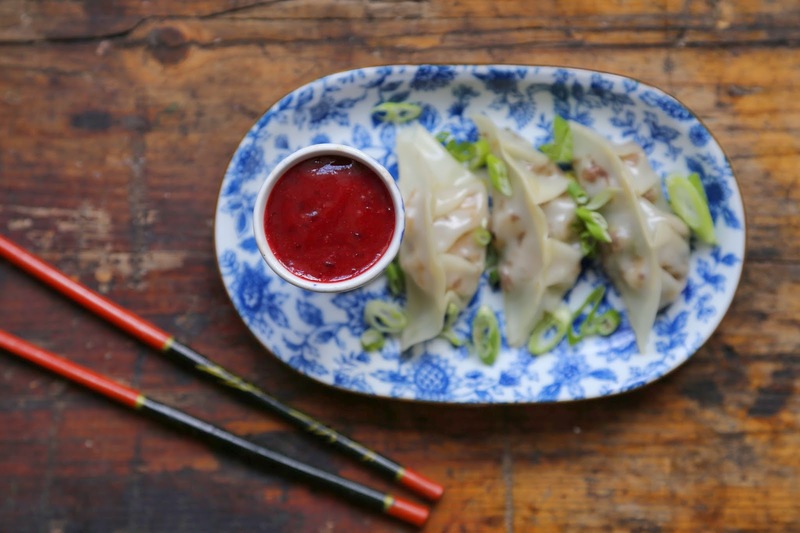 I’ve done an Asian style vegan filling for these gyoza but feel free to experiment, or incorporate Western flavours such as cream cheese and smoked salmon. The basic Chinese sauce is soy sauce, sugar, cornflour. The soy represents the salt, the sugar tips the flavour balance the other way, the cornflour thickens. Add ginger, garlic, five spice and you have the base of any Chinese style sauce. 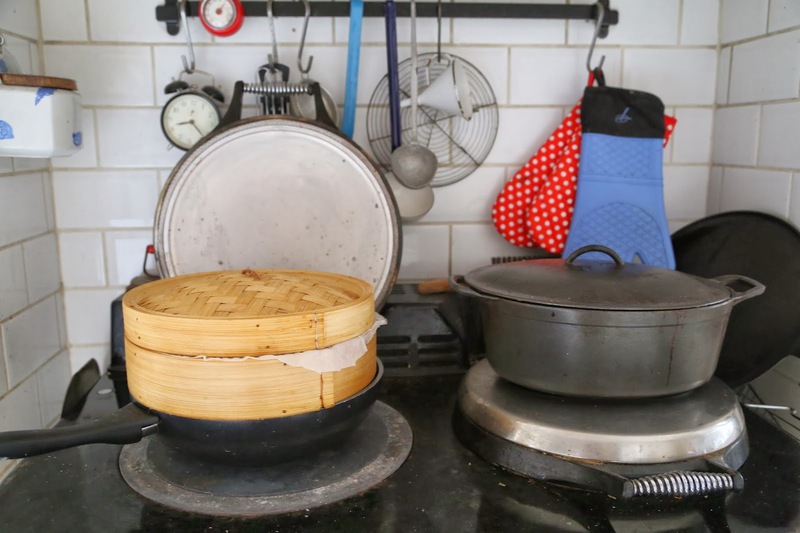 I made this in a wok which rather conveniantly fitted my bamboo steamer just perfectly. A bamboo steamer is very cheap, you can buy them in different sizes. Otherwise use a metal steamer. 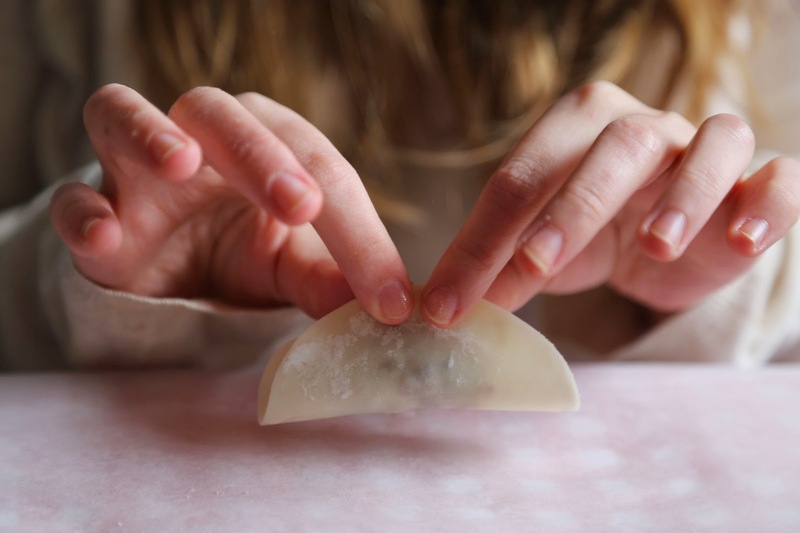 You need a flat surface as you don’t want to have the gyoza touching each other, they stick and rip the skin off. As for the plum sauce, you may have noticed that I’ve been cutting a trail through every plum recipe possible in the universe over the last few weeks. Right now I’m in South Africa where I’m going to be meeting the very farmers that produced all of these wonderful stone fruit. The plums, Flavorking, that I’ve been using for many of the purple plum recipes are in fact pluots, a blend of plum and apricot, which gives a slight ‘bubblegum’ flavour. These were originally developed in California and are a favourite of chefs. Pluots are mostly plum with a hint of apricot, plumcots are more of a fifty fifty mix, plum with an apricot mouthfeel. David Lebowitz wrote about his love of pluots and I met chef Jonathan Japha last night, of the highly vaunted Cape Town restaurant The Black Sheep, who was raving about pluots. I promised to get back to him with a supplier after my trip to Franschhoek next week where I’ll be hanging with the growers. Make the plum sauce first to get it out of the way. Make a cross on each of the plums with a knife. Boil a kettle of water, pour into a heat proof bowl as soon as boiled and plunge the plums into the bowl. Within a minute the skin should start to unfurl from the crosses and you can get to work taking the skin off. Remove the pits too. Then put all of the ingredients, minus the chilli sauce into a medium saucepan and heat until the plums break down a little, say ten minutes. Then place all the ingredients, including chilli sauce, into a powerful blender such as a Vitamix or use a hand blender, and mix at high speed. Taste the sauce to see if it needs anything more then set aside. Make the filling. Put all of the ingredients until the tofu into a hot wok or frying pan and sizzle for a couple of minutes. Then strain the tofu of all water and dice it. If the tofu is soft, place it on your hand and cut it on your hand then tip it into the wok. Fry the tofu for five minutes then add the spring onions an mushrooms. The mushrooms will release a lot of liquid. Fry until the mushrooms seem cooked, for about 3-5 minutes then prepare a jug or bowl with a sieve or chinoise. Put all the mixture into the sieve and let the excess liquid drain out. You don’t want a very liquid filling as the gyoza skins will not hold it. Then make a little gyoza filling station on a table. Kids and friends can join in with this and more hands make quick work. Get a small bowl of egg white or a bowl of water (if you are vegan) next to each person. Take a stack of gyoza skins for each person. Put the large bowl of cooled filling in the middle and give each person a teaspoon. 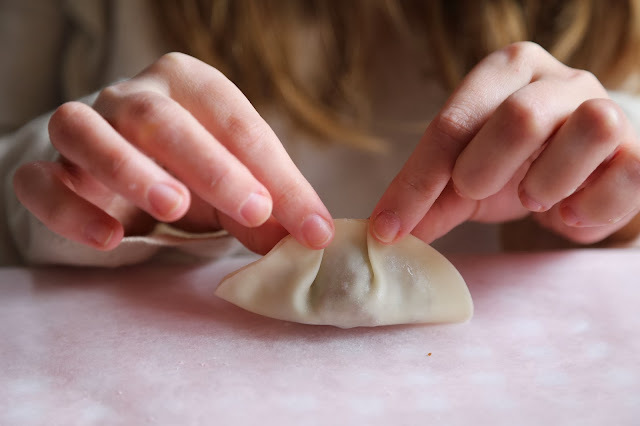 Lay out the gyoza skin and dip your finger into the egg white or water, run it around the border of the gyoza/pot sticker/chinese dumpling/wonton skin. Put a heaped teaspoon of filling into the middle then seal the gyoza according to the pictures below. You want four folds on one side, this creates a crescent shaped dumpling. Store them on a tray sprinkled generously with white flour, rice or wheat, this way they wont stick to the bottom when you remove them to steam. 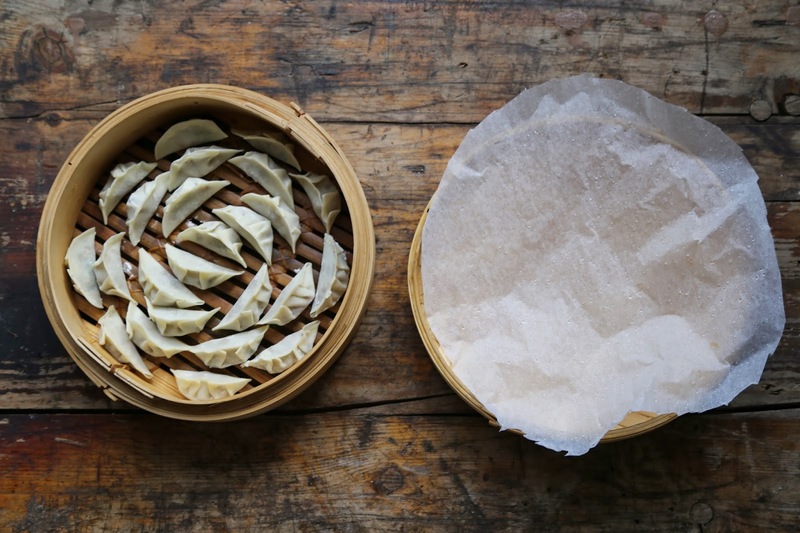 When finished, place all of the gyoza into a steamer, spaced slightly apart. 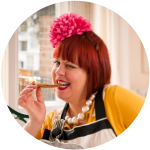 Take a piece of greaseproof paper and cut into the shape of your steamer. Run it under the tap so that it is moist. Prepare the pot or wok of boiling water and place the steamer over it. Put the circle of wet greaseproof paper over the gyoza then put on the lid. The gyoza take 20 minutes to steam depending on how freshly they were made and the thickness of the dough. When they are cooked they will be translucent. Serve them with the reserved green part of the spring onion and the plum dipping sauce. 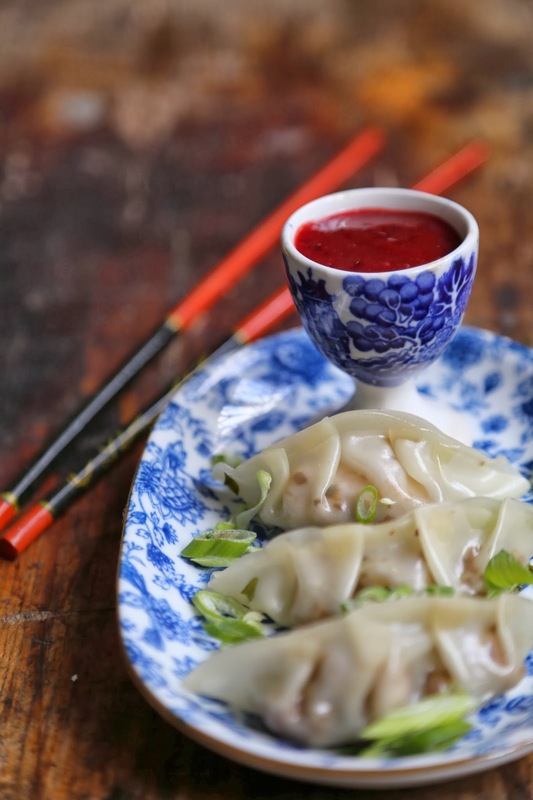 These look delicious – but where can you get gyoza skins in the UK? Hi rachel I don't know where you live but any Chinese or Japanese shop . Maybe you can order them online? Gyoza is just the japanese word for the same type of dumpling as potsticker (called war tip in Cantonese or guo tie in Mandarin), though potstickers (and indeed gyozas) usually have fried bottoms and steamed tops. Lovely pics. Thanks Lizzie so they fry a potsticker first then steam it? Hey Kerstin – sorry for late reply. Yes, you fry the bottoms first, then add a splash or two of water plus lid to steam, then remove lid to evaporate the water out. Thanks, good to know. So you don't have to transfer them to a steamer, you just steam them in the frying pan/wok with a lid? Sacrilege to fill them with cream cheese and salmon!! pot stickers, dumplings, dum sum, dim sim, ravioli I love these little beauties filled with delicate flavours but served with this plum sauce … delish. I just western dim sum in Cape Town at Koi, they weren't bad at all!